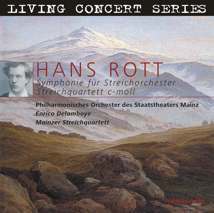 A bit later than expected, the tenth CD with music by Hans Rott has been released these days; it focusses on chamber music. The very first recording of the Symphony in A-flat major for String Orchestra - an early work - played by the Strings of the Philharmonisches Orchester of the Staatstheater Mainz with Enrico Delamboye conducting turned out well in sound and interpretation. This CD presenting the first German performance in March 2004 is also interesting for the members of the International Hans Rott Society who got a recording (annual gift) of the world premiere by the Cappella dei Giovani, as the Mainz interpretation shows a completely different approach. The interpretation of the String Quartet in c minor by the Mainzer Streichquartett is also of a high standard and stands comparison with the recently released Mandelring Quartett recording, all the more so as the Mainz musicians frequently take clearly different ways. The new CD is available from Acousence (ACO-DC 20205). Members of the IHRG get this CD and others at special prices; for details see Die QUARTE. You will find samples and further information at www.hans-rott.de/cdemz2.htm. On April 12, 2005 Hagen/Germany witnessed the world premiere of the Suite in E major. Hans Rott had written this work which consists of two movements for an examination in composition which took place on May 27, 1878, and it counts among his most beautiful compositions. The convincing interpretation by the Philharmonisches Orchester Hagen with the young General Music Director Antony Hermus conducting has been a great success with the audience. The Suite (the concert began with Haydn's Symphony No. 22 in E-flat major "The Philosopher") was followed by another premiere: For the first time the Hagen audience was attending a performance of the Hamburg version (1893) of Gustav Mahler's First Symphony. In comparison with the well-known late version there are some differences in the instrumentation, and the most striking of them is the additional "Blumine Movement" set between the first and the (nowadays) second movement. In an introduction given before the concert as well as in the programme booklet, Jörg Rothkamm pointed out the relations of motif and theme between Mahler's Symphony and Rott's Suite in E major. What strikes one most is the fact that the choral theme of the finale of Mahler's Symphony, played by the horns as from bar 388 on, is almost identical with the first half of the main theme of Rott's Suite, viz. in the interval as well as the rhythm sequence. All Mahler did was to add just one note in the beginning. Rothkamm raises the question whether Rott could be the one Mahler mentioned as the hero of this Symphony. Read more about this question, the work in general and its world premiere in one of the next issues of DIE QUARTE. It is very good news that the concert has been recorded and both works by Rott and Mahler will be available on CD. We will let you know the date of release as soon as get the information. Only recently we have learned, that the Italian pianist Gregorio Nardi performed in public almost all playable compositions for the piano as well as some fragments by Rott in Florence on September 15, 2004. Besides 13 works by Rott the programme included compositions by Robert Schumann, Richard Wagner, Anton Bruckner, Hugo Wolf, Arnold Schönberg and Alexander von Zemlinsky. IHRG members will learn more about the pianist and his concert in the next issue of DIE QUARTE. There are now only a few works by Rott awaiting their world premiere. A total of six performances of the Symphony No. 1 in E major by the Neue Philharmonie Westfalen with Johannes Wildner conducting (Gelsenkirchen, Kamen, Papenburg, Recklinghausen and Dortmund, all in Germany) in March had been a success with audience and reviewers. The five performances of the Symphony in A-flat major for String Orchestra in Sweden had been successful, too. The Huaröds Kammarorkester's interpretation - conductor Mats Rodin - is said to have been very interesting. Within the next few days there will be three performances of the Symphony No. 1 in E major by the NDR Sinfonieorchester and Alan Gilbert conducting in Northern Germany (Hamburg, Kiel and Lübeck). The Hamburg concert will be broadcasted by the radio station NDR Kultur on May 16, 2005. On August 16, 2005 Thomas Staudinger (baritone) and Klaus Laczika (piano) will perform Lieder by Hans Rott and other composers in St. Florian/Upper Austria. On October 27, 1005 Erwin Horn, Vice President of the International Hans Rott Society, will give a lecture on Hans Rott ("The Madman and his Symphony") in St. Moritz/Switzerland. The performance of the Symphony No. 1 in E major in Kassel/Germany (Orchester des Staatstheaters Kassel, conductor Rasmus Baumann) which was originally planned for April 17, 2005 had to be postponed on short notice and will now take place on February 6, 2006. A good twelve months after the Asian premiere, Tokyo will see another performance of the Symphony No. 1 in E major: On February 16, 2006 Christian Arming will conduct the New Japan Philharmonic Orchestra. On June 10 and 11, 2006 there will be even two orchestral works by Rott to be heard in one single concert in Berlin: The Berliner Sinfonie-Orchester with Sebastian Weigle conducting will perform the Symphony No. 1 in E major and the Prelude to "Julius Caesar". For more detailed information please see, as always www.hans-rott.de/whatson.htm.